On January 23, 2019, Idera, Inc., parent company of global B2B software productivity brands, announced the acquisition of Travis CI, a market leader in continuous integration. Travis CI joins TestRail in Idera, Inc.’s Testing Tools division, which also includes Ranorex and Kiuwan. We’re thrilled to welcome Travis CI to the family. Travis CI is a continuous integration platform used by more than 700,000 developers worldwide to build and test software applications. 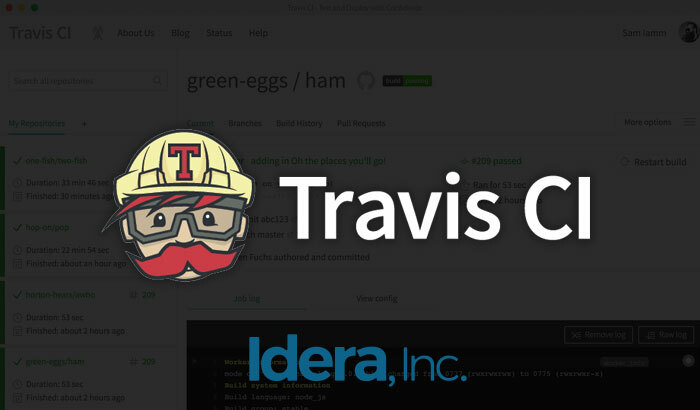 Travis CI integrates with most other tools in the software development lifecycle, making the platform extremely popular with developers and highly complementary to Idera’s Developer and Testing Tools offerings. Read more about the acquisition on the Travis CI blog. Idera, Inc. delivers B2B software productivity tools that enable technical users to do more with less, faster. Idera, Inc. brands span three divisions – Database Tools, Developer Tools, and Testing Tools – with products evangelized by millions of community members and more than 50,000 customers worldwide, including some of the world’s largest healthcare, financial services, retail, and technology companies. To learn more, visit: Ideracorp.com. Travis CI helps development teams build, test and deploy software for their customers and community. With over 30 different languages as well as Linux, Windows, macOS/iOS and Docker environments, Travis CI supports diverse projects and organizations across every industry.